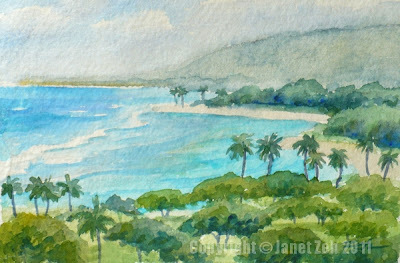 Here we have an original impressionist watercolor on handmade paper of Ala Moana Park Beach in Honolulu, Hawaii - #3 in my Tropicals collection. I painted this scene looking towards the park from the 11th floor lanai, or balcony, of the Ilikai Marina Condominium. The waves are breaking at a distance from shore above the coral reef. Due to the reef and clean white sand, the water is a gorgeous shade of turquoise blue. Handmade paper has its benefits and its challenges. It requires a skilled brush because corrections cannot be made without ruining the surface of the paper. But this very fact means that the piece cannot be overworked, so any successful painting is fresh. Little surprise elements from the irregular surface give it a handmade look.